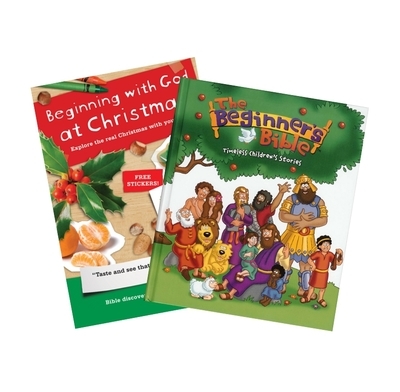 Great deal on Beginning with God at Christmas and The Beginners Bible. This special Christmas pack contains a copy of Beginning with God at Christmas - our popular Bible reading resource for pre-schoolers - and The Beginner's Bible, which our children's editor, Alison Mitchell, has picked out as one of the best children's Bibles available. With this great value pack, you can get both titles for less than the RRP of the Bible on its own! It would make an ideal Christmas gift for parents with toddlers - especially those who don't usually read the Bible together. Beginning with God at Christmas helps parents with young children to explore the real Christmas story with their child. Eight Bible stories cover the events of the first Christmas, and a quick introduction to who Jesus is. This special Christmas edition differs slightly from the regular Beginning with God books. The left side of each page is the same as usual containing the 'main course' which leads toddlers through that day's true story from the Bible. On the right side there is space for the sticker and also a picture to colour in (based on the sticker) that illustrates the story you have been reading about. This colouring picture is in place of the usual Appetiser menu and Snack for the journey. This makes the book even easier to use and especially accessible for families who don't normally read the Bible together. This Christmas edition provides a simple way to start your child in a regular habit of reading God's word and growing to know God, who loves them. It's an ideal introduction to the full 'Beginning with God' series. Why not send Beginning with God at Christmas together with The Beginners Bible to a family that you would like to encourage to read the Bible together? Click here to see our special offer where you can get both titles for less than the price of the Beginners Bible on its own! Please note that Beginning with God at Christmas uses a selection of stories and illustrations from Beginning with God Book 1. Books arrived very quickly. Realising that some that I had bought were too old for the children they were intended for I phoned the company and was dealt with by a very helpful staff member who exchanged them for others which arrived before I'd even sent the wrong ones back. That's good service!. As enjoyable and helpful as the usual Beginning with God studies for 2-4 year old's, and really helpful in the run up to Christmas. A little disappointed that there were only 5 studies included on the Christmas Story as was hoping to use it as an advent build-up, but apart from that, really great studies. My little one loves them, especially the stickers!! My two and half year old loves this book and can't wait to do his Bible study as he calls it. The colouring and stickers have gone down a treat. It was very straightforward to use and a great way of focusing on Jesus at this time of year. Terrific - interactive and helpful for engaging with the Beginner's Bible with extra ideas for how to talk with your children about what you're reading. Going to give it away as gifts for our Playtime Children this Christmas.... we went looking at Easter time for an Easter version.... would be great to find this from the Good Book company next Easter! I bought this for my 5 year old and she has hardly looked at any other book since getting it! The stories are just the right length to hold her attention and she loves the colourful pictures. Highly recommended for this age group. My 4 year old son couldn't wait at bedtime each night to do the next part of the story. A brilliant way to introduce the gospel in a simple way to a young child. How many books can we read before bed-time daddy? Just one tonight because it's late. Can we read the bible book daddy? Do you need any more endorsements! When will we expect Beginning with God: Book 3, 4, 5 etc...? My Grandson has not seen this book yet as I have bought it for his birthday which is in July, but I am very pleased with it as it is very colourful just what youngsters need to attract their attention.